This folky American flag dates to the end of the Civil War. There are several features of this flag that indicate that it may be a replacement color for a Union Army unit, possibly a company. The flag is similar in size and shape to known Union Army company colors, which tended to be rectangular rather than the nearly square shape of a regiment. The canton of the flag is taller than it is wide, which is a particular trait of known on other military colors from the Civil War era. The strongest indicator that this is a military flag is the presence of a souvenired star from the blue field. Souveniring is typically encountered on wartime flags, and is a military tradition where members of the unit will cut pieces of the flag to commemorate the war or the loss of an officer or high ranking member of a unit. Souvenired flag pieces surface occasionally in the marketplace as relics from the Civil War. Replacement colors were made to replace an issued unit flag if the unit lost their primary flag either in battle or due to wear and tear. The stars of this flag are hand sewn and double-appliqué, and the stripes of the flag are treadle sewn with a fine stitch. The entire flag is made of cotton, with the canton being a beautiful royal blue color. 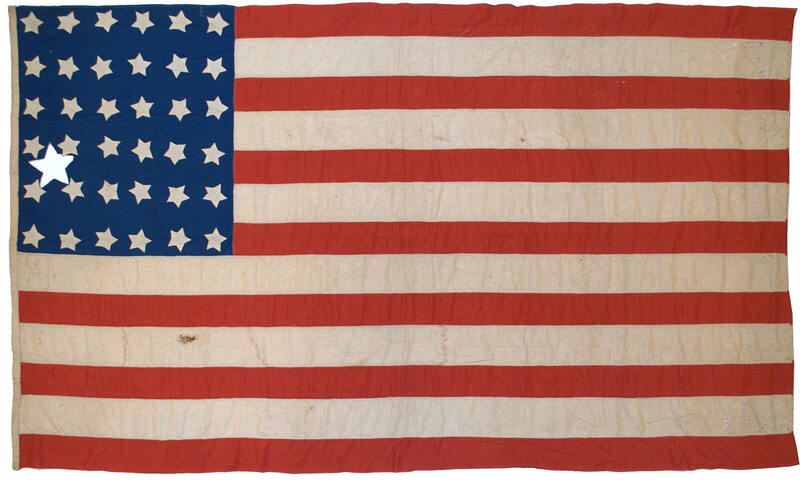 Although the specific history of the flag is lost, the flag was acquired for the Rare Flags collection from a Civil War dealer who had purchased it, along with other military collectables, from a long time Civil War collector.